Heading to #TGC19? Join us for a panel discussion on denominations. Do they help or harm the unity of the church? The March 2019 Weekender is sold out, but there is some availability for students taking the Weekender for class credit. Travel to Capitol Hill Baptist Church in the nation’s capital for a behind the scenes look at one church dedicated to growing biblically. The 9Marks Conference Northwest will be a chance for you to listen and learn about the difference Biblical Theology should make for both the doctrine and the function of the local church. 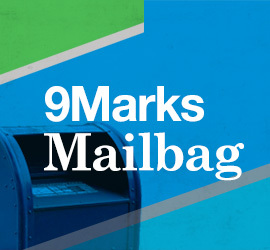 9Marks Conference at Midwestern is a 2-day academic conference focused on the topic of Biblical Theology. 9 Marks at 9 at the Georgia Baptist Convention is an opportunity for pastors to come together and think about faithful pastoral ministry. With the election of a new Executive Director of the GBC, we want to discuss the future of Baptist denominational life in Georgia. This year’s conference, November 6-7, theme is “Discipleship & Growth” from the 9Marks of a Healthy Church. 9Marks and the North American Mission Board are partnering together for a one-day conference on church planting and revitalization in Washington, DC. Join us for a time of fellowship and learning at a two-day workshop as pastors Chris Newkirk and Josh Vincent consider the biblical definitions and implications of a healthy church. Mark Dever will be speaking on the Marks of a Healthy Church at the 10th Annual Conference of Razem dla Ewangelii, in Torun, Poland. Join us for a time of fellowship and learning at a two-day workshop as pastors Bret Capranica and Brad Wheeler consider the biblical definitions & implications of healthy churches. A conference about the church, for the church.